The Trump administration is challenging an arbitrator’s decision that could force the Veterans Affairs Department to rehire many recently fired employees and deal a significant blow to one of President Trump’s signature legislative achievements. VA has filed exceptions to the Federal Labor Relations Authority to a third-party ruling that found the department had run afoul of its collective bargaining agreement in enforcing provisions of the 2017 VA Accountability and Whistleblower Protection Act that made it easier to fire employees. The arbitrator’s decision would impact a portion of the employees represented by the American Federation of Government Employees who have faced an adverse action under the new authorities granted by the law. Trump, VA and lawmakers in both parties have heralded the law as a significant step in cracking down on misbehaving and poorly performing employees, but its enforcement has been mired in controversy since its passage. Cheston McGuire, an AFGE spokesman, said the union must respond to VA’s challenge by Oct. 24. It’s unclear how long FLRA will take to decide on the case, but McGuire expects it could take up to one year. 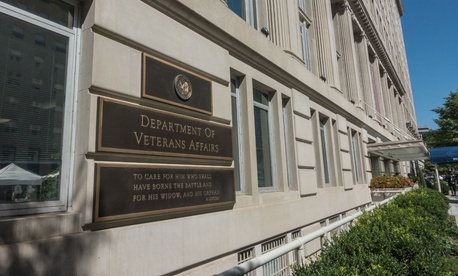 The arbitrator ruled that VA must resume compliance with its collective bargaining agreement, rescind any adverse action against AFGE-represented employees who did not first receive a performance improvement plan, and reinstate them at the department, including back pay, restored leave and other benefits. VA would pay AFGE’s attorney fees if Ross’ ruling holds. Public data posted by VA shows about 1,700 employees were fired outside of their probationary periods between the time the department issued the memos last August and July 2018. It is unclear how many of those employees were denied opportunities to improve their performance and are represented by AFGE. The union represents more than two-thirds of the department's 383,000 workers. Trump frequently cites the success of the accountability law as one of his proudest accomplishments as president, saying it has enabled the department to get rid of poorly behaving employees. Lawmakers have for months accused VA of flouting congressional intent in implementing the accountability law. Earlier this year, a group of senators wrote a letter voicing concerns specifically about the elimination of performance improvement plans and lack of progressive discipline. The senators said new policies have led to employees being fired for “missing deadlines or moving slowly after an injury,” even on first offenses. Such actions, they said, “are not the types of offenses that rise to the level of immediate termination,” an authority provided in the 2017 law. VA has also faced criticism for disproportionately firing low-level employees, such as housekeeping staff. A June letter asked VA’s inspector general to investigate the law’s enforcement, and while no Republican signed onto either letter, Republican leaders on the department’s oversight committees have voiced concerns. The IG is currently probing the law’s enforcement. “VA makes absolutely no apology for holding employees accountable when circumstances warrant," Cashour said in June. "If former employees feel their removal from federal employment is improper, they have a number of appeal options under federal law." At a House hearing on the law in June, then-acting VA Secretary Peter O’Rourke defended the department’s policies, but acknowledged it still had work to do to ensure consistent enforcement.